In order to understand a breed, you should know a little bit about their history. 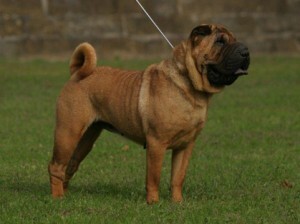 The Chinese Shar-Pei originates from Southern China, probably from the Dah Let or the Pearl River delta area around Canton. The dogs were probably used for fighting dogs and bred for that reason. They were called the Chinese Fighting Dogs. They thought that the loose skin would make it easier for them to turn and bite their attackers, giving them an advantage. That really didn’t work out too well as they dogs did not really have the fighting temperament. Sometime during the 1960′s and early 1970′s, the Chinese passed a tax on dog owners in order to discourage dog ownership. There was also a campaign to exterminate dogs as the government thought they held no value. By crossing the border into Hong Kong, dogs found a safe place to exist. At that time many of the Chinese Fighting Dogs were crossed with other dogs in order to create what we know of now as the Chinese Shar-Pei. In 1971 Dogs magazine ran an article about saving the endangered breeds, “Who’ll Save Our Endangered Breeds”. In 1973, Matgo Law made his plead for American dog breeders to help save the Chinese Shar-Pei. From that plea, he started sending dogs to the United States to some of the 200 people that responded. 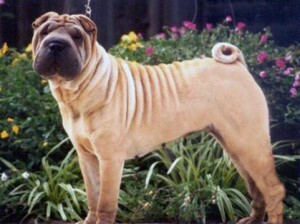 There are two varieties of coat types in Shar-Pei. One is the horse coat, which is a very short, harsh coat. The second coat type is the brush coat. This coat is slightly longer but no longer than 1 ” and should also be harsh. The name Shar-Pei comes from the Chinese words meaning “sand skin”. The extremely harsh coat is one of the distinguishing features of the breed. The typical Shar-Pei will be between 18″ – 20″ in height and weigh between 45 to 60 pounds. They come in many colors including dilute colors. Only solid colors and sable are acceptable colors and are to be judged on an equal basis. The distinguishing features of the breed are: their bluish-black tongue and mouth, including the roof, gums and flews (tongues and mouths of dilute dogs will be lighter or solid lavender color), wrinkling of the skin, triangular shaped ears pointing towards the eyes, a tail that curves over the back and the dip in the top-line just over the withers. The Shar-Pei is an extremely clean breed. They like to live in clean places and to keep their living space clean as well. For that reason, many of them will do their business in the further-most corner of their yard so their play and running area can stay clean. This is not something that you need to teach them. It is their natural instinct. Puppies are easy to house train and are often housebroken before they leave their litters. Puppies actually house break themselves. This is also a unique instinct they are born with. It is one of the reasons that they make great house companions. When you move a Shar-Pei to a new home, you must allow them a few days to learn where to ask to go outside etc. They will learn their new routine quite easily. Shar-Pei are a pretty mellow breed and once they have outgrown the puppy stage, they are fairly calm dogs. They are very loyal dogs and extremely devoted to their families. There isn’t much they wouldn’t do for their owners. When you leave them home, they are waiting at the door for your return. Many of them will watch from the window for the owners to return and can recognize the vehicles that the family drives. They want to be in the same room as their owners and will follow you from room to room. Shar-Pei will either sleep close to your feet while you watch television, or they will lay in a spot so they can watch all the entrances to the home while keeping an eye on the owners as well. If you have your heart set on a lap dog, then this probably is not the breed for you. Although they are stand-offish with strangers, given time they will become friends with them as well. Most Shar-Pei love children, and are very protective if they feel that someone is trying to harm a child. Shar-Pei are watch dogs and they take their job seriously of watching over their homes and family members. Although they aren’t really known as barkers, they will certainly alert you to a stranger approaching the home or to anything out of the ordinary going on outside. If you hear a Shar-Pei barking wildly, you had better go investigate. Some people don’t believe that dogs can show empathy, but Shar-Pei can! They sense when you are sad and will do their best to show you their deep love for you as well as try to make you feel better. They are very affectionate dogs and might even shower you with kisses, although that is not reserved for just being sad! Exercise is something that every dog needs. 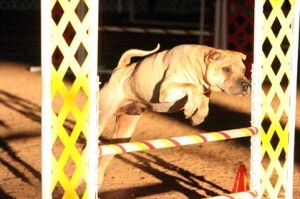 The Shar-Pei requires daily exercise whether that is daily walks or the opportunity to run freely in a fenced backyard. They love to run in the yard, keeping it free of the dreaded squirrels. Some dogs in our breed are natural trackers and have fun tracking anything that has crossed their yard. Learning is not a problem with this breed. They love to learn new things but they also can be a little stubborn. If they feel that what they are learning is not fun or useful there might be a problem. On the whole, they love to please their owners and will try just about anything the owner asks of them up to a point. We have quite a few dogs in our breed that participate in conformation, obedience/rally, agility, therapy work, lure coursing, herding, flyball and freestyle dance. There are several multi-titled dogs that have earned Versatility titles from the CSPCA. Most of the breed has a pretty good understanding of the difference between working and playing. You can often find them playing outside of a show or performance ring, but get serious and down to business as soon as they cross the line into the ring. Shar-Pei like to run the show, so the owner needs to let them know who the boss is. They are very happy to have the owner step up to fill that role, but if the owner doesn’t do that, then the dog probably will. Most get along fine with other dogs and animals and it is easy to run these dogs in a pack as long as they know who the boss is. Puppy Kindergarten classes, obedience training and socialization are always recommended. As with any breed, there are things that you need to do on a regular maintenance basis. The breed is pretty much a “wash and wear” breed, bath them when needed and let them air dry. Their hair is so short that blow drying is not necessary. Their nails grow very fast so it is a good idea to trim the nails weekly. Since the ears fold over towards the face, that structure is the ideal setting for ear problems. Weekly cleaning of the ears when you do the nails is recommended. The breed usually “blows their coat” (sheds) twice a year with the changes of seasons. During this time you will probably want to brush the loose hair out of their coat. The Chinese Shar-Pei makes a perfect companion. Once people own one, they seldom change to another breed. They truly are a unique breed. All in all, the owners of this breed are just as devoted to the breed as the dogs are devoted to the owners. 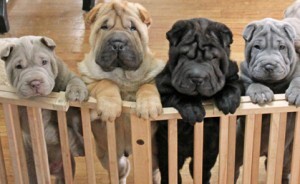 You probably need to know that Shar-Pei are like potato chips – you can’t have just one. Posted by chesliepickett on Oct 7 2013. Filed under Featured, The Buzz. You can follow any responses to this entry through the RSS 2.0. Both comments and pings are currently closed.